Cheap Flatbed Towing Service. Flat Tire, Wreck, Call us! If you live in Etobicoke, Toronto, Mississauga or anywhere in the GTA and need your sports car, truck, motorcycle, boat, trailer, forklift, tractor, airplane, or motorhome / RV towed safely, give us a call for fast and efficient flatbed towing! When a vehicle is towed with two wheels on the road the bumper is at risk for damage based on the road conditions. Big potholes or large speed bumps (both very prevalent in downtown Toronto) can damage the bumper of a 2-wheel towed vehicle. Also the hook and chain styled 2-wheel tow can be hard on the ignition, transmission and engine of certain vehicles. We always advise a flatbed tow in these scenarios, but the risk is up to the customer. If your vehicle is drivable, it's fast and easy to drive it up on to the flatbed tow truck, strap it down and go. In a 2-wheel tow job, the tow truck driver has to remove your drive shaft to prevent damaging your engine during the tow but that hassle is not required during a flatbed towing job. Flatbed towing for your precious toys. 2-Wheeled towing can allow for the towed vehicle to sway behind the truck. When road conditions and/or weather is bad, this can create a challenging environment to other drivers and pedestrians. The safest tow in Toronto and the GTA is a flatbed tow. Flatbed towing has the vehicle up high and securely strapped in place with visible markers, cutting down on any likelihood for surprises. 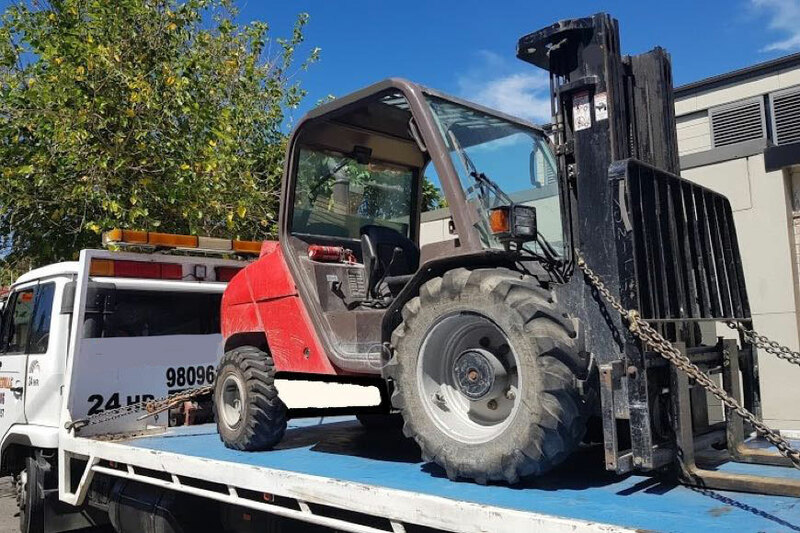 If your vehicle has a broken axle, has no wheels or is a large, industrial vehicle or piece of machinery, flatbed towing is your only option! 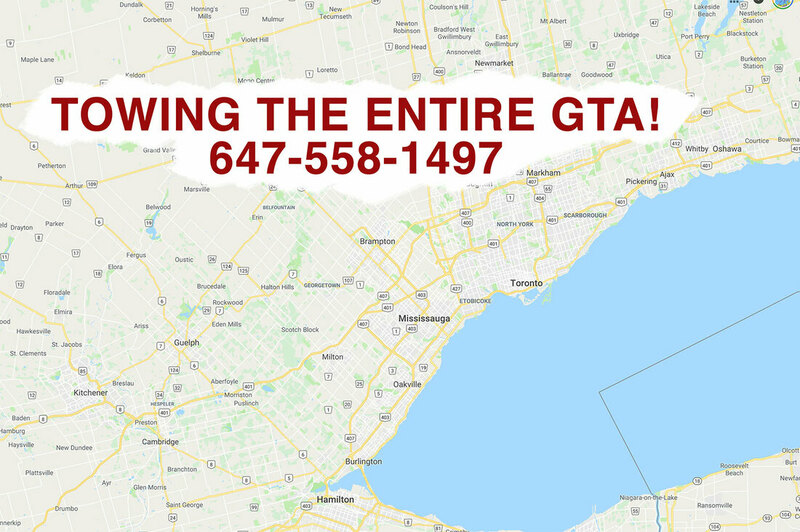 No matter where you are in the GTA, call us, let's get it towed! Whether you’re stuck on the side of the road, need a cheap tow truck that won’t take advantage of you, or just need a depending tow truck driver, we offer it all, and for less! Protect your sports car with a flatbed tow truck! Forklift towing across the Greater Toronto Area! Toronto Towing, Mississauga Towing, Scarborough Towing and more! Whether you have a flat tire and cannot fix it, or an engine problem, Flatbed Towing Etobicoke are just a call away. We are located in the area and can offer quick and high quality roadside services with our fleet of tow trucks. Our flatbed tow trucks have a solid base of wooden planks with drop sides for easy towing. Call us from anywhere in the Greater Toronto Area and we will rush to your assistance. Our rates are very reasonable and our company has a reputation of being efficient and trustworthy. Flatbed tow your vintage airplane? No problem - Call us! If you can drive, fly or float it, we can tow it with our flatbed trucks that are optimized for heavy towing and recovery services! Affordable Etobicoke tow truck services that you can rely on is what we offer at GTA towing services. We pride ourselves in being able to offer all types of towing services to the greater area of Etobicoke, at reasonable prices and with the best tools available. Our towing services are available 24/7 for all drivers in the Etobicoke, Toronto area. If you are looking for Roadside Assistance of any kind be sure to call GTA Towing Services in Etobicoke. Call us on 647-558-1497 for immediate assistance. Tow Truck Etobicoke is a local towing service that offers professional equipment with highly qualified personal for all roadside assistance.